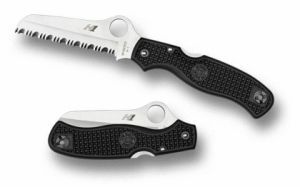 KNIFE SPYDERCO C89SBK Atlantic Salt is a folding pocket knife, suitable for everyday use. The blade is serrated, sharpened unilaterally made of stainless steel H-1. In his upper back, a hole for easy opening. Handle is synthetic type FRN.